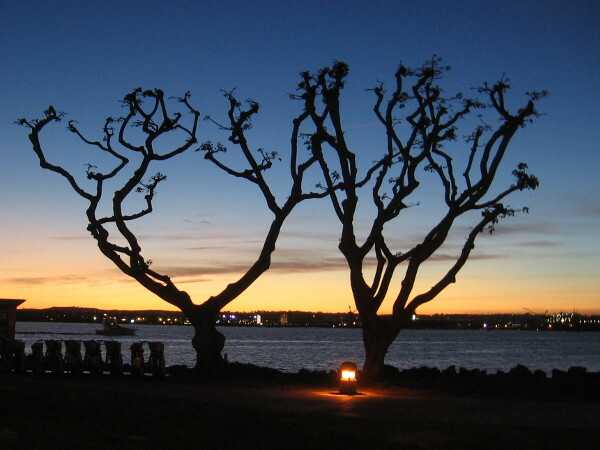 twilight – Cool San Diego Sights! Magical golden light on San Salvador. 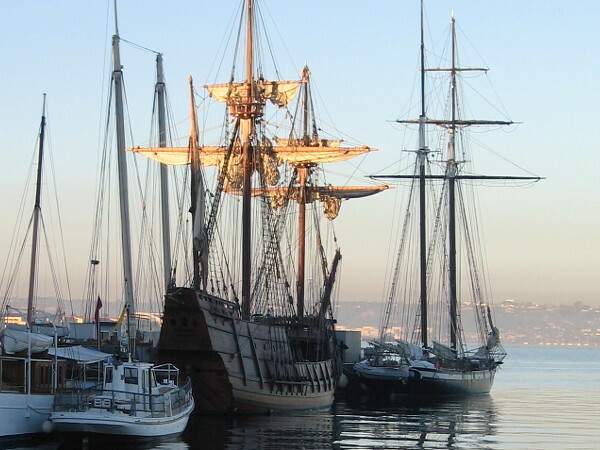 Masts and furled sails of the Spanish galleon replica San Salvador turn golden shortly after sunrise. Photo taken past the figurehead of Star of India. 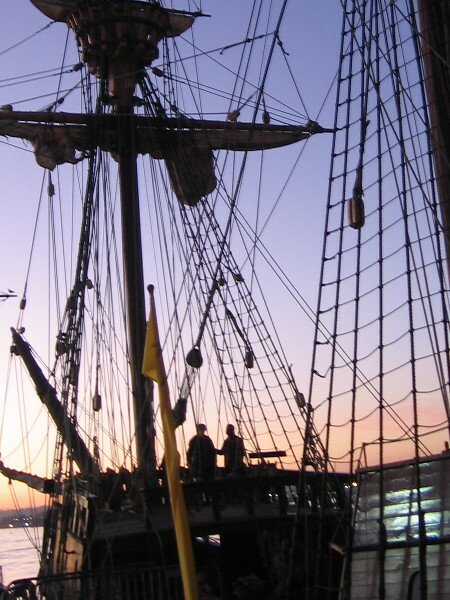 I apologize, but I love tall ships so much I’m presenting another small batch of photographs. 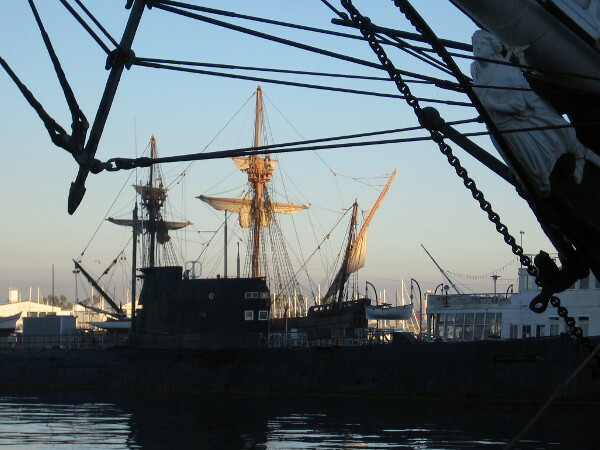 I captured these images of San Salvador at the Maritime Museum of San Diego yesterday morning and this evening. 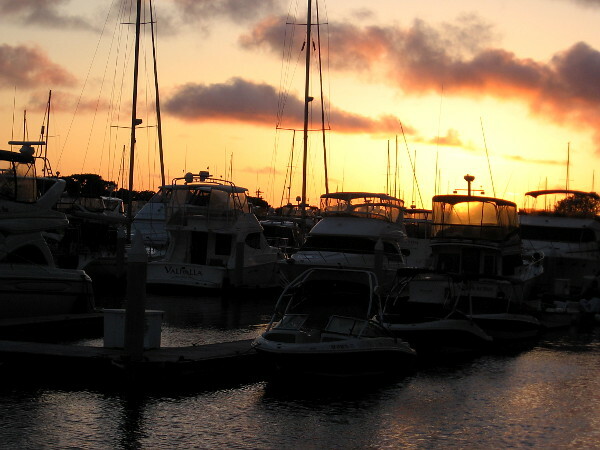 Both the early and late sunlight performed magic, transforming the furled sails into gold. 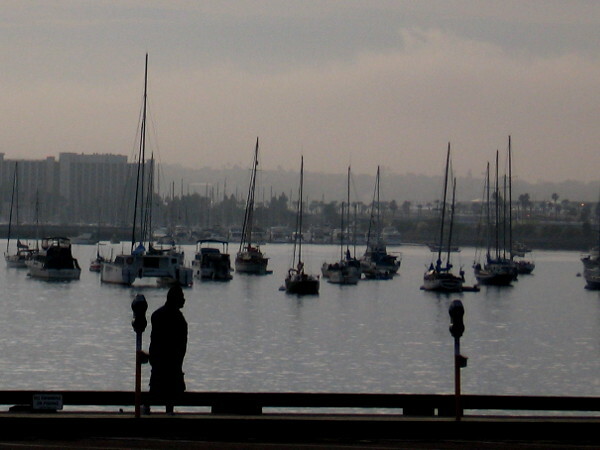 San Salvador in early morning light, and its glowing reflection in San Diego Bay. 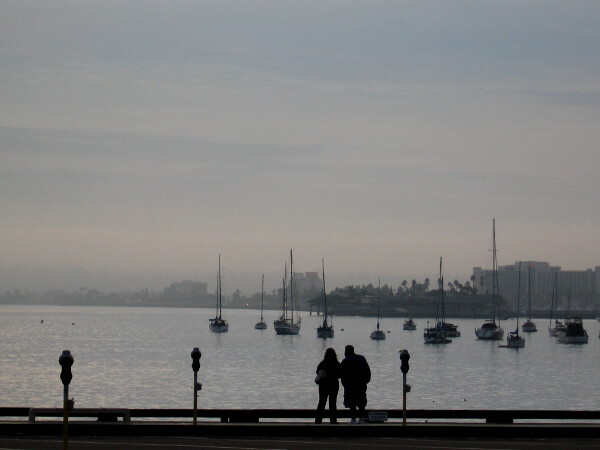 Morning magic at the Maritime Museum of San Diego. 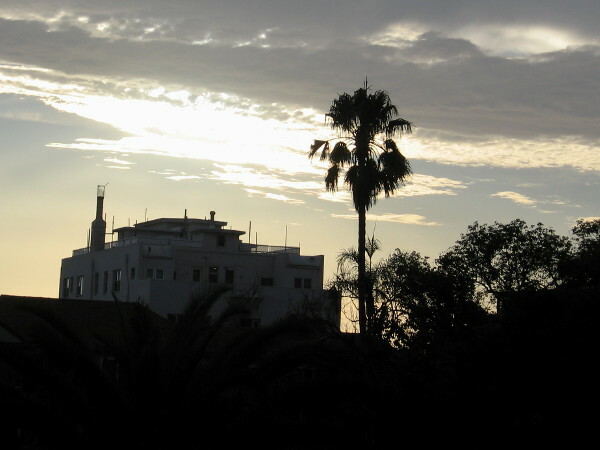 Photo of the San Salvador shortly after sunset. 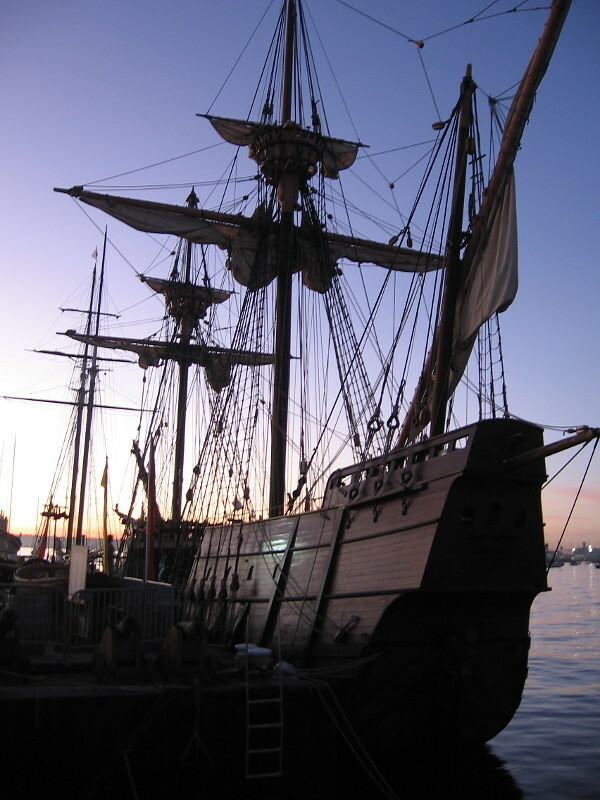 The amazing tall ship is a replica of the galleon commanded by explorer Cabrillo in 1542. 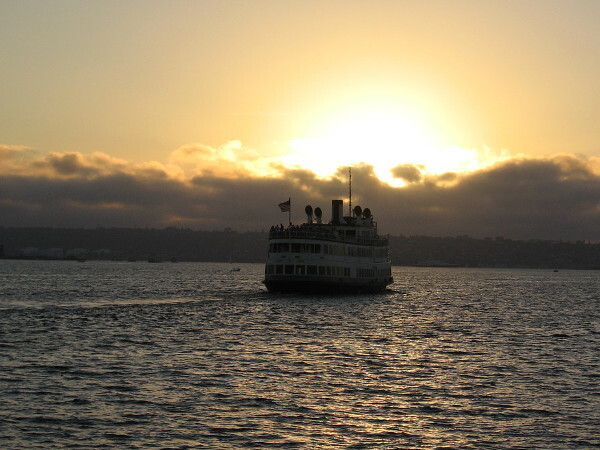 Visitors to the Maritime Museum of San Diego pause on the beautiful ship San Salvador as evening slowly turns to night. 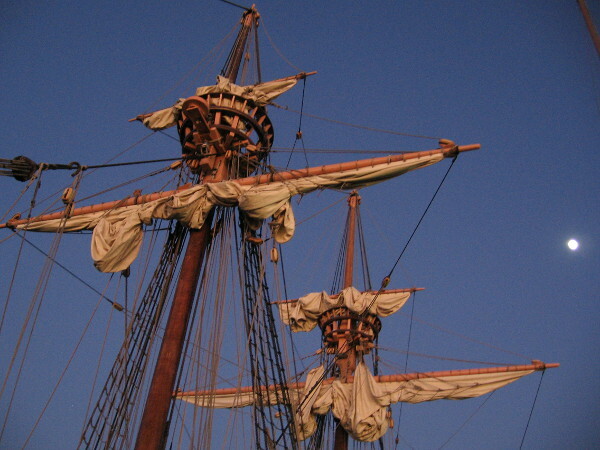 The last golden rays of sunlight strike the furled sails of San Salvador, under a nearly full moon. 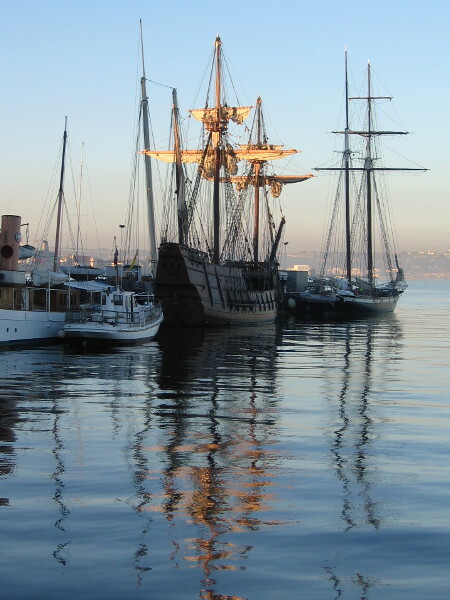 Posted on December 29, 2017 Tags embarcadero, light, magic, maritime museum, morning, photography, reflection, sailing, san diego, san diego bay, san salvador, ships, tall ships, twilight1 Comment on Magical golden light on San Salvador. 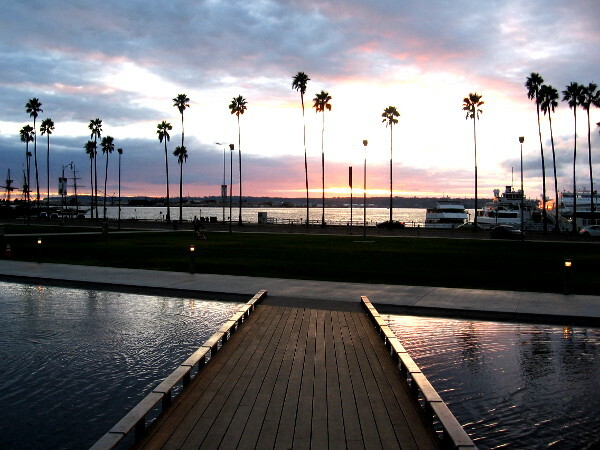 Light, water and sunset at Waterfront Park. 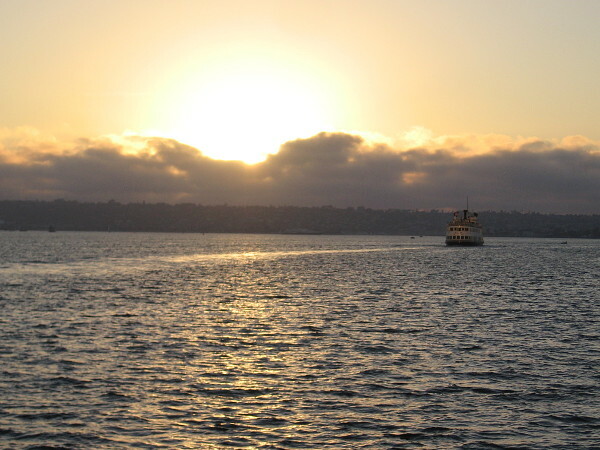 Looking west toward San Diego Bay at sunset, from the north section of Waterfront Park. November already. It’s getting dark earlier and earlier. After work today, when I got off the trolley at the Little Italy station, the sun was almost ready to set. 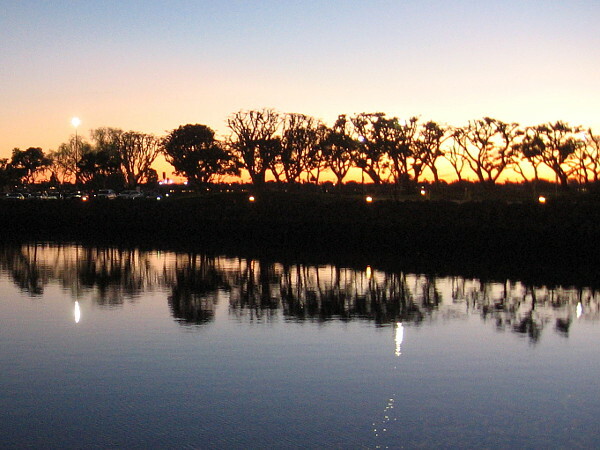 So I hurried across Pacific Highway to the quiet north half of Waterfront Park to take in the beauty. 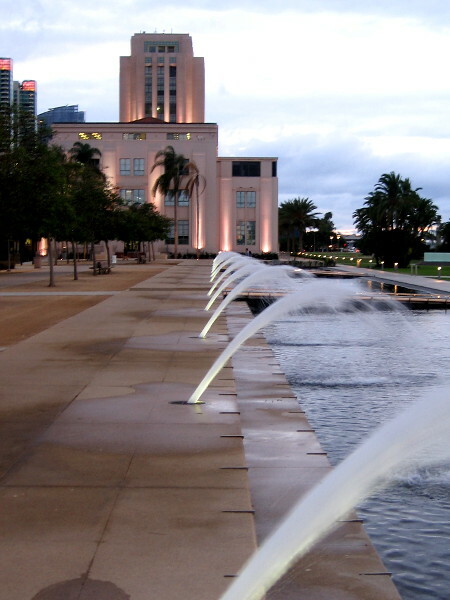 Looking south past the lighted fountains toward the County Administration Building. 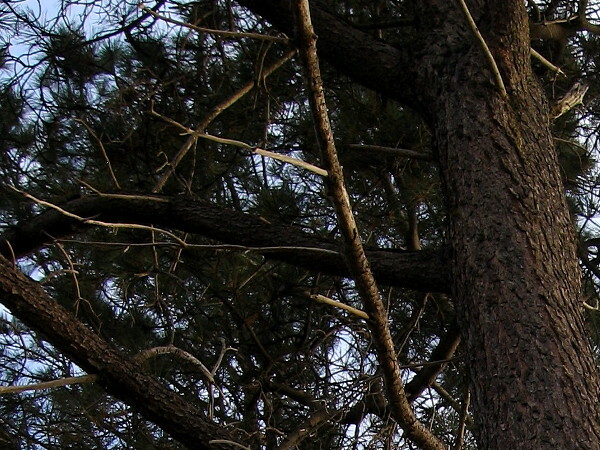 It soon will be dark. 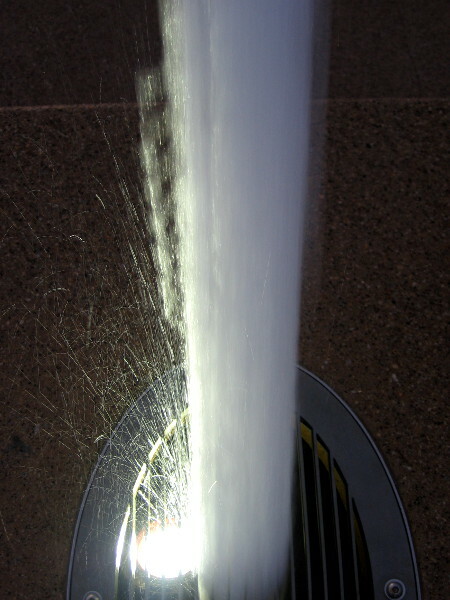 Light along a splashing fountain as darkness approaches. 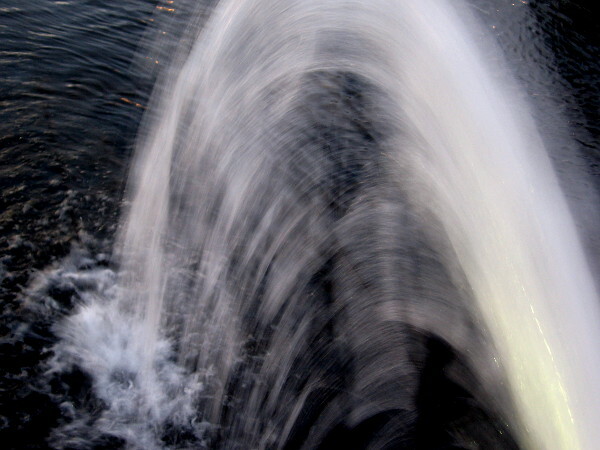 The jetting water is lit brightly from beneath. Looks like sparklers! 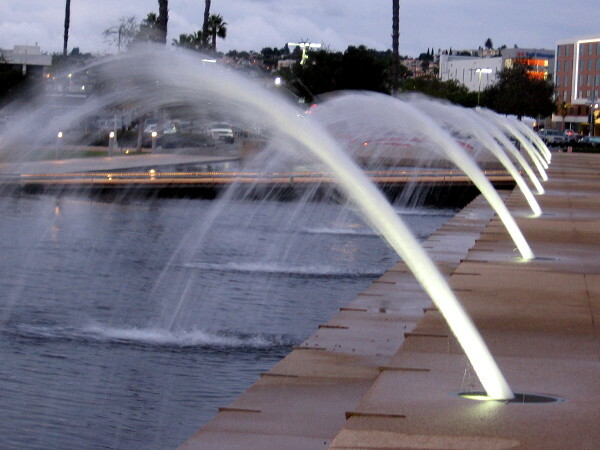 Gazing north through the beautiful fountains of Waterfront Park. 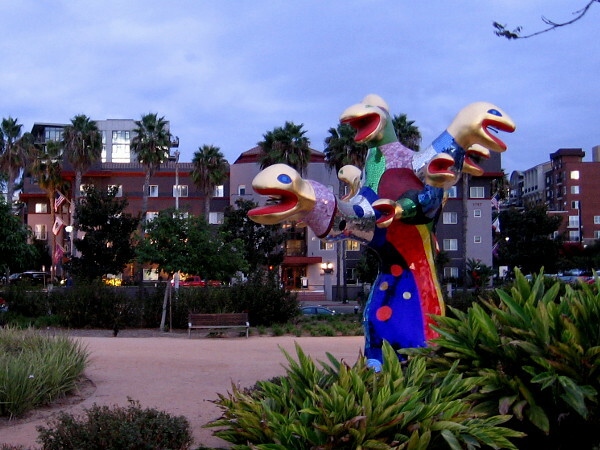 To the east, nearby building windows and Niki de Saint Phalle’s colorful Serpent Tree gleam, reflecting late light. Lights have come on. 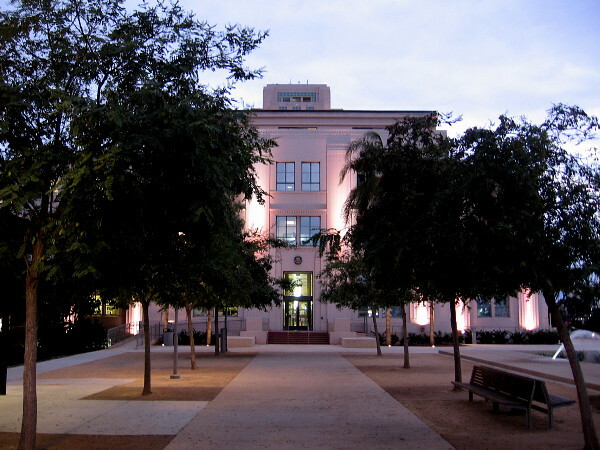 The north end of the handsome County Administration Building is ready for night. 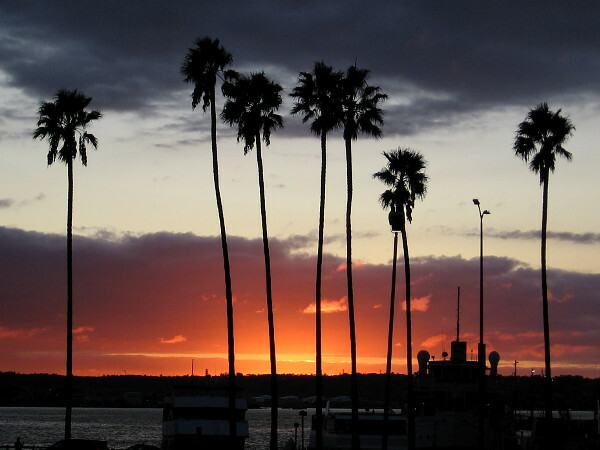 A blazing sunset beneath palm trees on San Diego’s Embarcadero, as seen from Waterfront Park. 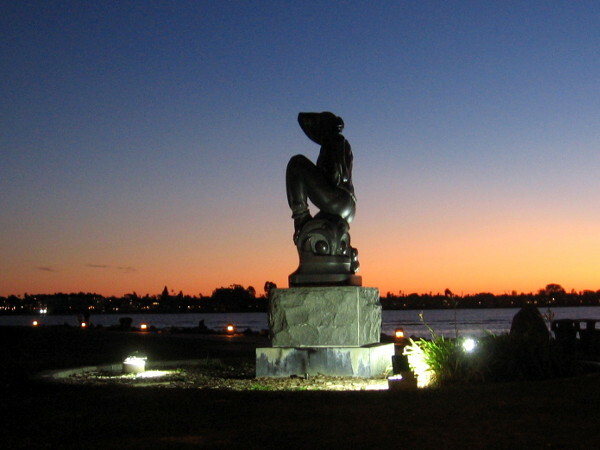 Posted on November 1, 2017 Tags beautiful, buildings, embarcadero, light, night, parks, photography, public art, san diego, sculpture, sunset, twilight, walking, water3 Comments on Light, water and sunset at Waterfront Park. Dreams of gold on the darkening blue. 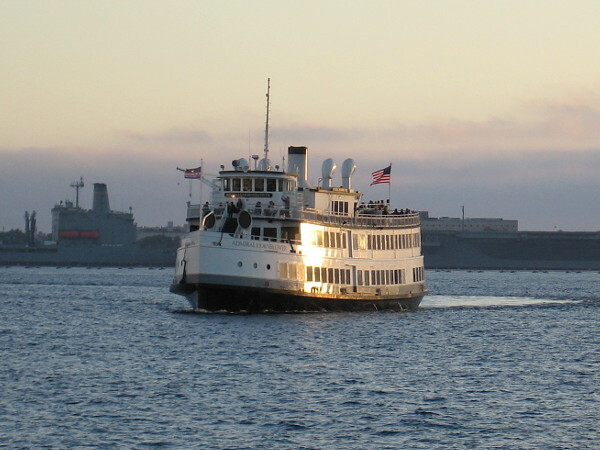 Admiral Hornblower on blue San Diego Bay. 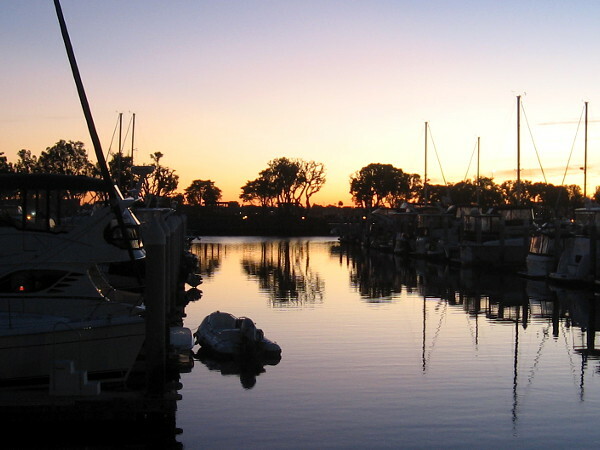 It gleams in the last rays of daylight. 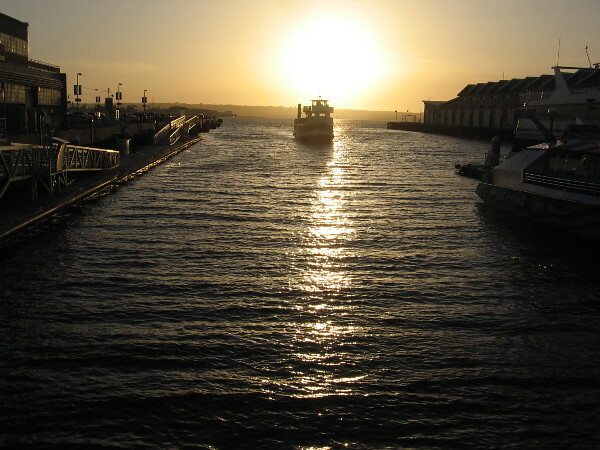 The ship moves across the darkening water toward a golden sunset. 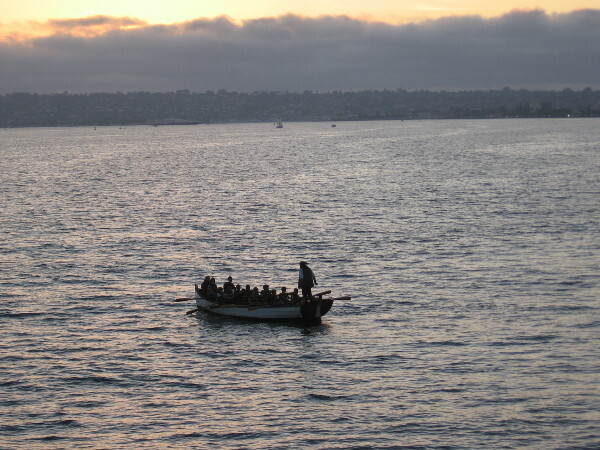 Young students row a Maritime Museum of San Diego longboat as the sun sets. Perhaps they dream of finding pirate gold. 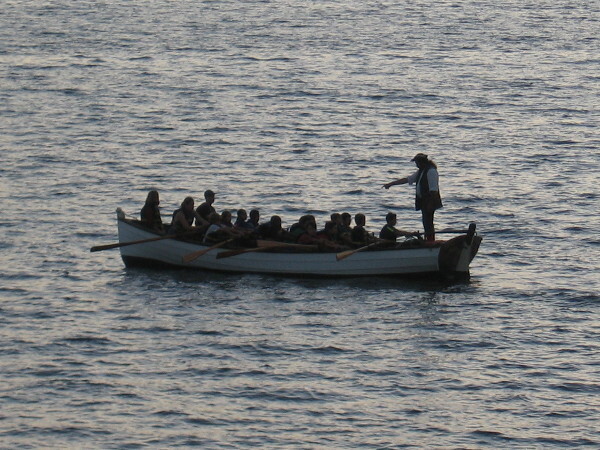 Rowing the longboat forward across the water. They move together, as if in one twilight dream. A trail of gold glistens behind Admiral Hornblower as it moves into the mysterious distance. 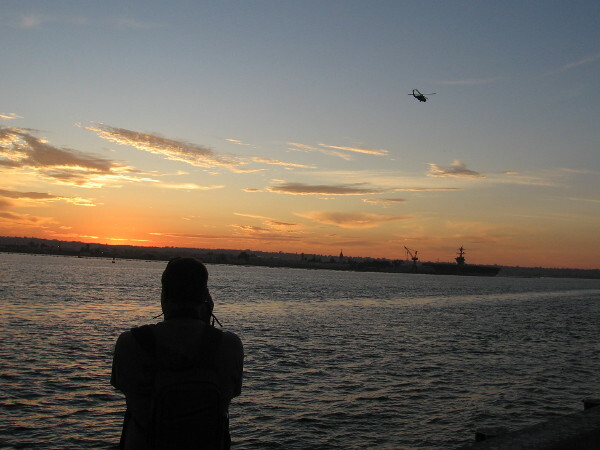 Posted on September 29, 2017 September 29, 2017 Tags boats, dreams, harbor tours, kids, maritime museum, mysterious, photography, san diego, san diego bay, ships, students, sunset, twilight, water3 Comments on Dreams of gold on the darkening blue. A few photos around sunset at Marston Point. This evening around sunset I took a short walk through Marston Point, which is located in the southwest corner of Balboa Park. 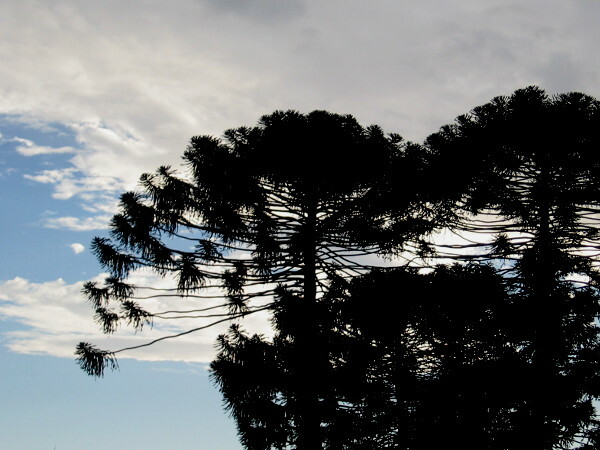 Trees were gradually darkening. 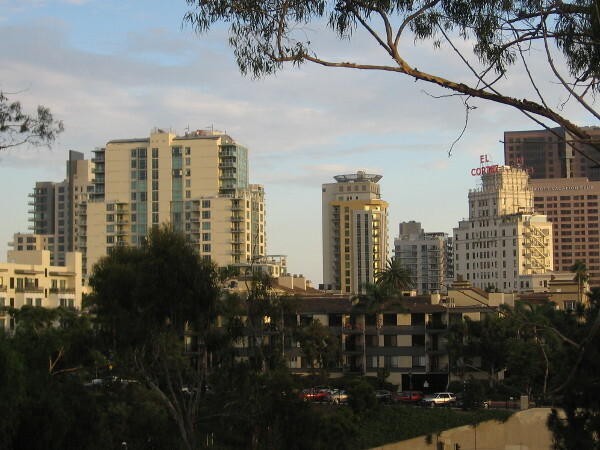 Directly to the south, Cortez Hill–the part of downtown San Diego where I live–gleamed like a shining paradise in the sky. 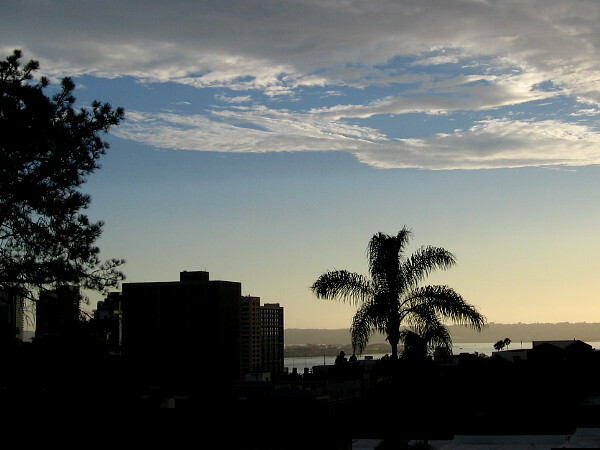 To the west, buildings near the bay and on Bankers Hill were crowned with streaks of pale gold. 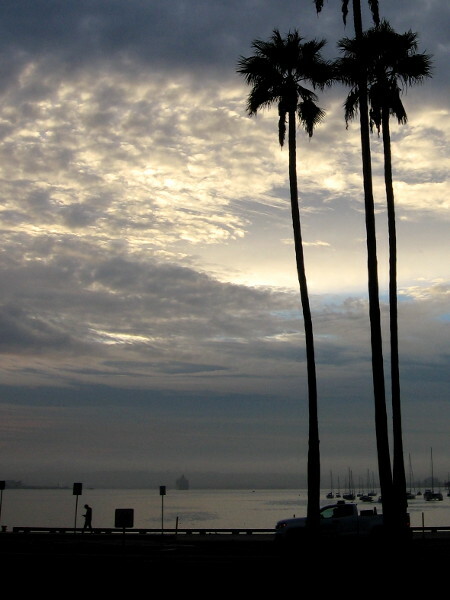 Posted on August 1, 2017 Tags balboa park, bankers hill, beautiful, clouds, cortez hill, downtown, light, photography, san diego, sky, sunset, trees, twilight, walkingLeave a comment on A few photos around sunset at Marston Point. A short, beautiful twilight walk down Broadway. 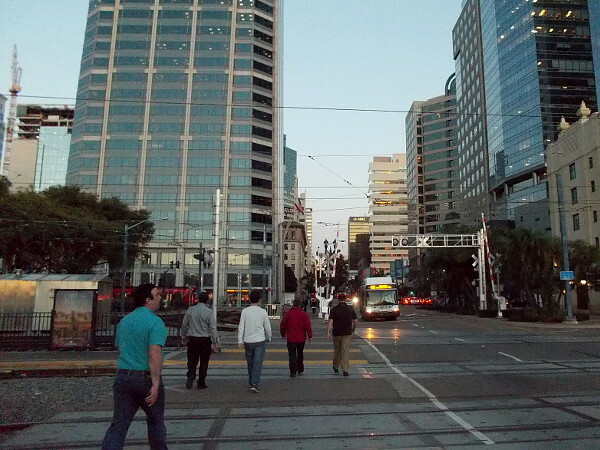 Walking from the Embarcadero east down Broadway just moments after sunset. I got off work early today. 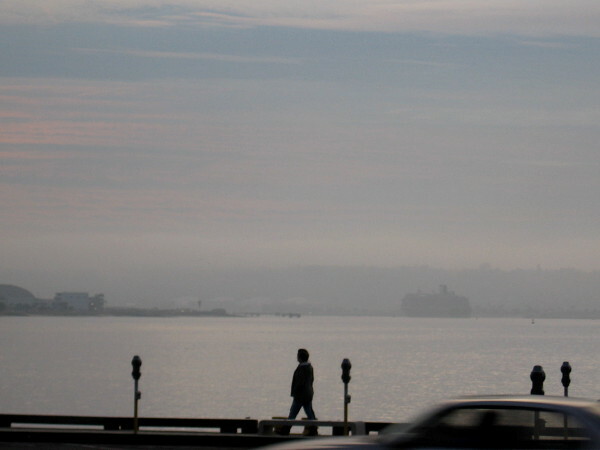 So I enjoyed some magical time on the Embarcadero. Moments after the sun set, thinking of home, I walked from the Broadway Pier east a short distance into the heart of downtown. My lifted eyes were fascinated by the changing light. 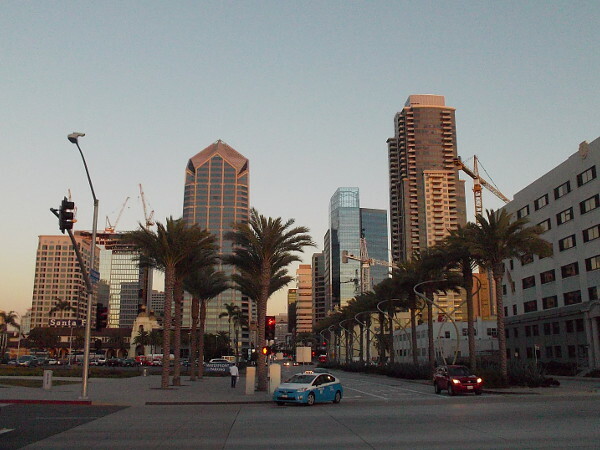 High buildings in downtown San Diego change color with every passing minute as my feet and twilight steadily progress. People walking a couple blocks east of the Broadway Pier cross railroad tracks in softening light. 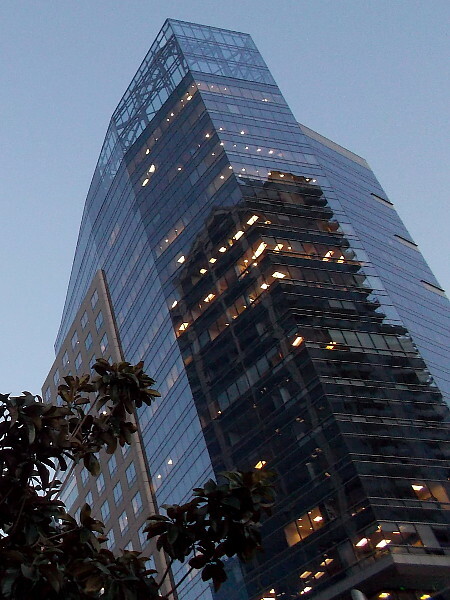 The lights inside two tall office buildings in downtown San Diego begin to make interesting patterns. 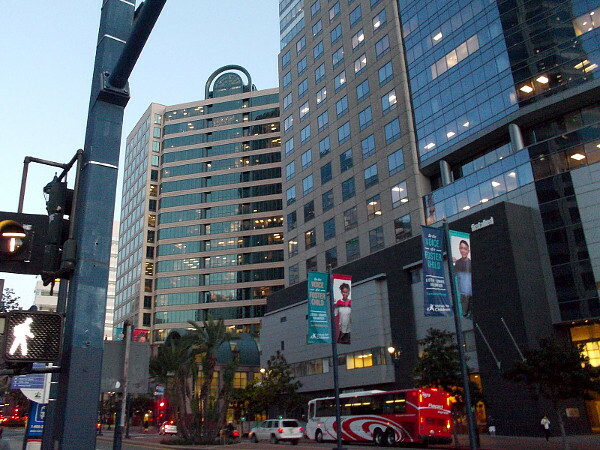 Looking upward across Broadway as I near the America Plaza trolley station, where I’ll catch a short ride toward home. It soon will be night. 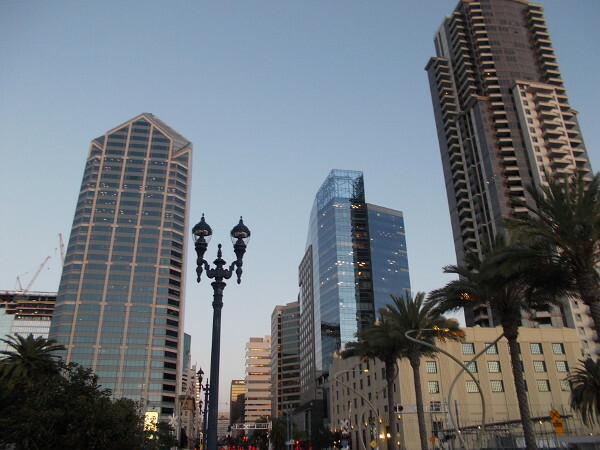 Posted on January 26, 2016 Tags beautiful, buildings, city life, downtown, embarcadero, magic, photography, san diego, sky, skyline, twilight, walking4 Comments on A short, beautiful twilight walk down Broadway.